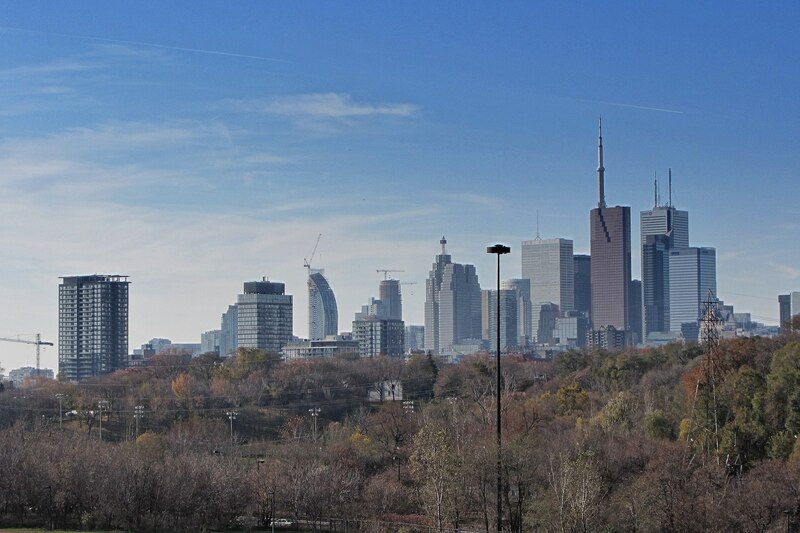 a view of the Lower Don Valley and downtown Toronto from Broadview Ave.
My Icelandic Sheepdog Viggo and I spend an hour most days walking a stretch of the trail along the Don River, which runs from north to south right through the eastern edge of downtown Toronto. While no one will mistake it for a wilderness corridor, there are moments when I forget that I am smack dab in the middle of four million people. All images expand with a click. 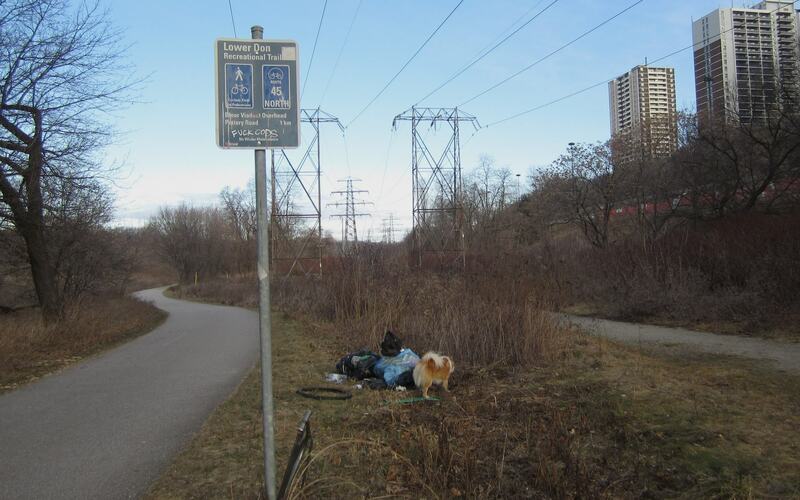 In the dozens of pix that I have posted of our walks, the Don Valley you see is one that may make you think – “Where is this guy walking his dog? Is this really Toronto?” The reality is, unfortunately, a little different from what I usually choose to frame in my viewfinder. 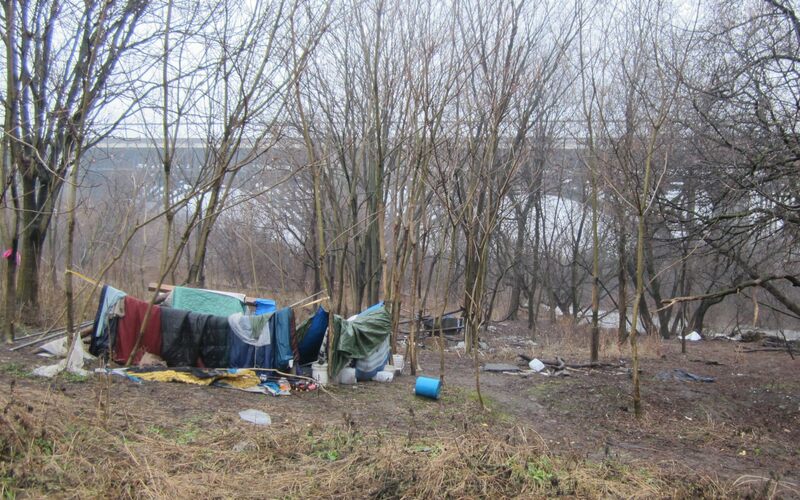 This post will show you a far shabbier and depressing Lower Don Valley, but also one that need not be this way. 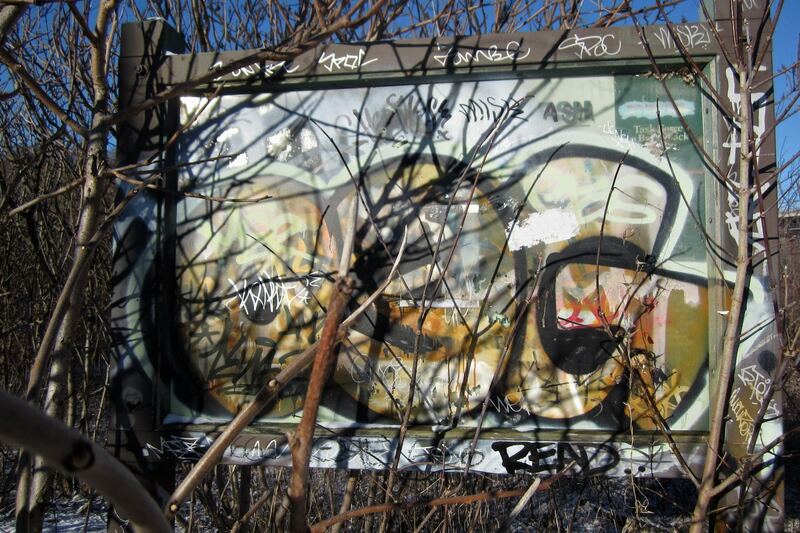 Forget for a moment that a major expressway comes down to the east of the Lower Don area; forget too the CN rails that run up on the west side of the river or the abandoned rail line that runs along the Don’s east side. Forget too the natural gas and oil pipelines that use the valley to access downtown, as do the hydro-electric towers with their wires. As they say, this is life in the big city; there is nothing I can do about these ingredients of a modern urban environment. 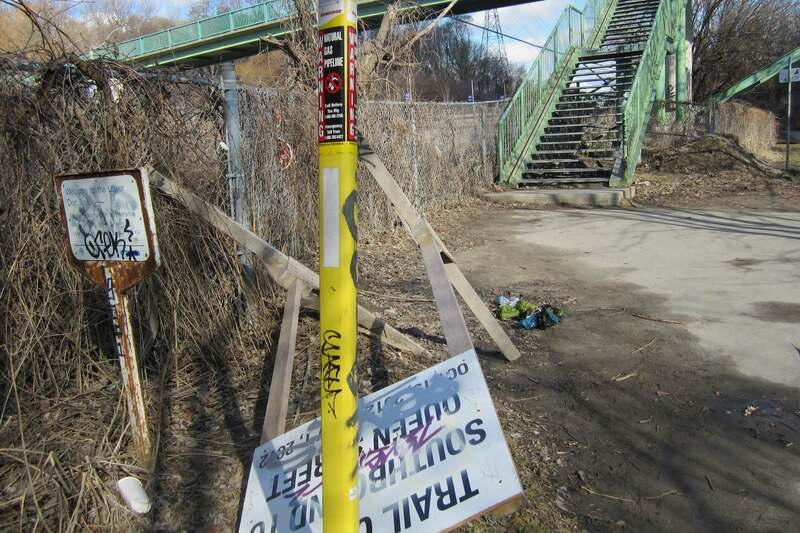 The sign has been there since last fall, left behind by the City crew working on the Queen Street bridge in October. 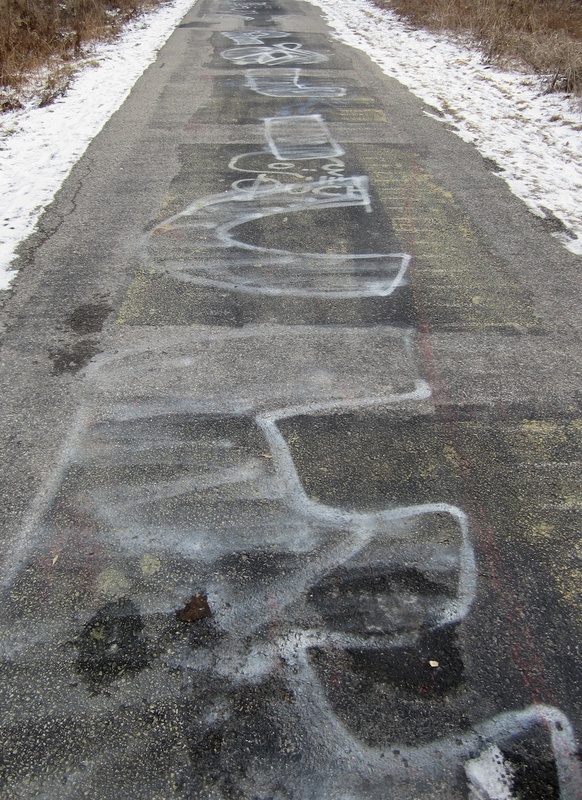 Graffiti covers signs and natural gas pipeline indicators. Dog owners leave piles of doggie poop bags where there used to be a garbage can. I turn north and starting walking up the multi-use path. 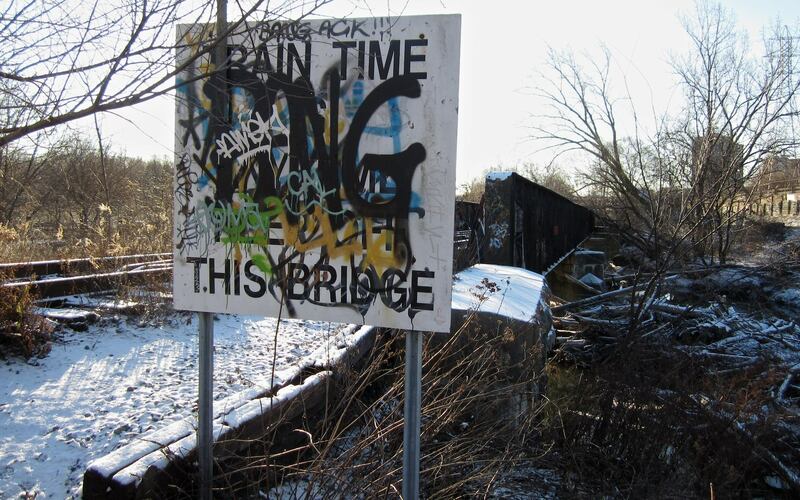 I cross the bridge and look to the northwest and this is what I see – massive graffiti on the rail line bridge crossing the Don. I understand that Metrolinx is responsible for this rail line and – I am assuming – the bridge itself. This bridge has looked like this for years. 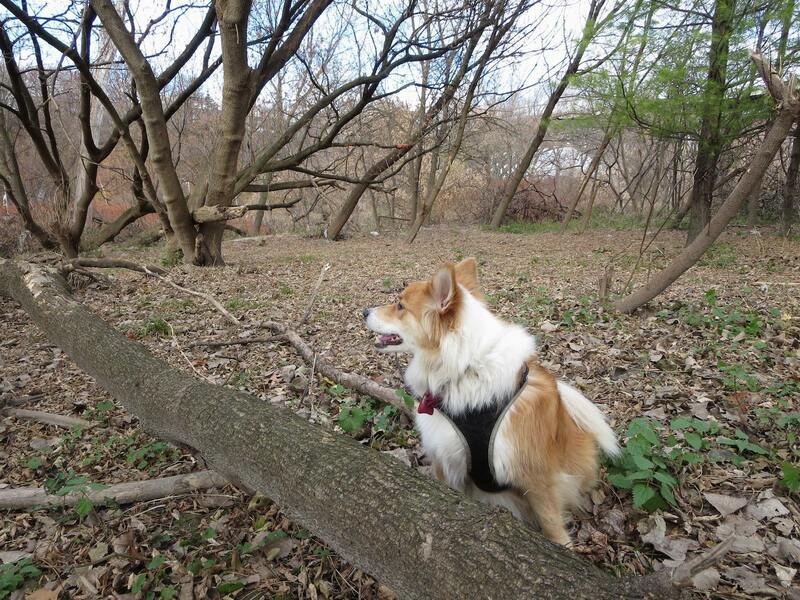 We soon rejoin the main recreational trail and keep on walking. I should mention that this trail is used by at least two or three hundred people every day when the trail is clear of snow (as it has been all year except for the two weeks from Dec. 27 to about Jan 8 of this year). The Parks Department attention to the trail is minimal and does not venture more than a couple of feet from either side of the actual trail. 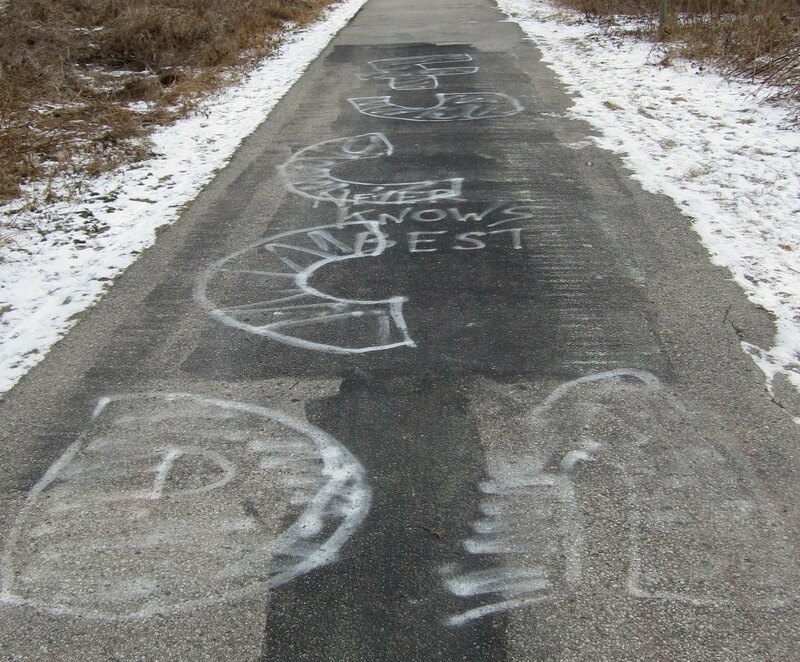 It should also be noted that the Parks people do nothing for the trail all winter (i.e. October to May!) in spite of the fact that for most of the winter the paved trail is clear of snow and is used by cyclists, joggers, strollers, and folks like me walking their dogs. Somehow the City works on a schedule created in 1972 that does not take into account that weather patterns have changed significantly in the past forty years. It is really rather pathetic. We turn left by the above sign and walk the side trail; beautiful views of the winding river can be had. Here is this morning’s version of a shot I will admit to having taken a couple of dozen times before! 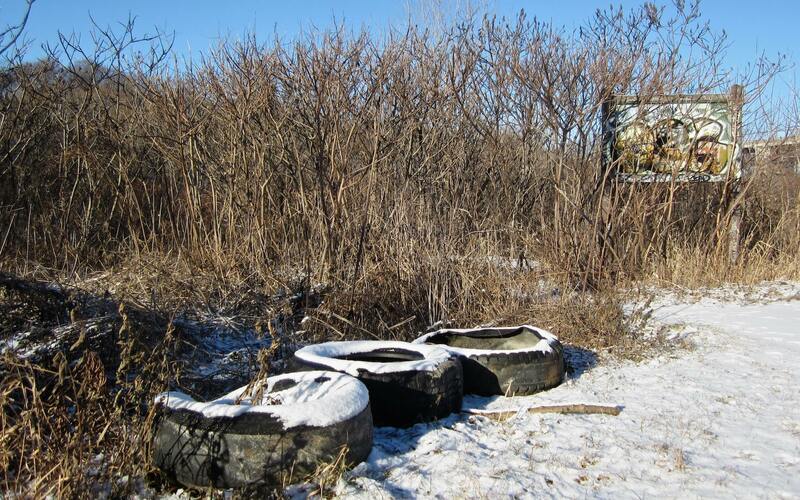 Until last year there were garbage cans down along the recreational trail – perhaps a half-dozen in the stretch from the Riverdale footbridge to Pottery Road. After someone overturned all the cans one October day (2011) and I notified the city, a crew showed up (ten days later) and dealt with the garbage. They also took away the garbage cans. They have never returned. 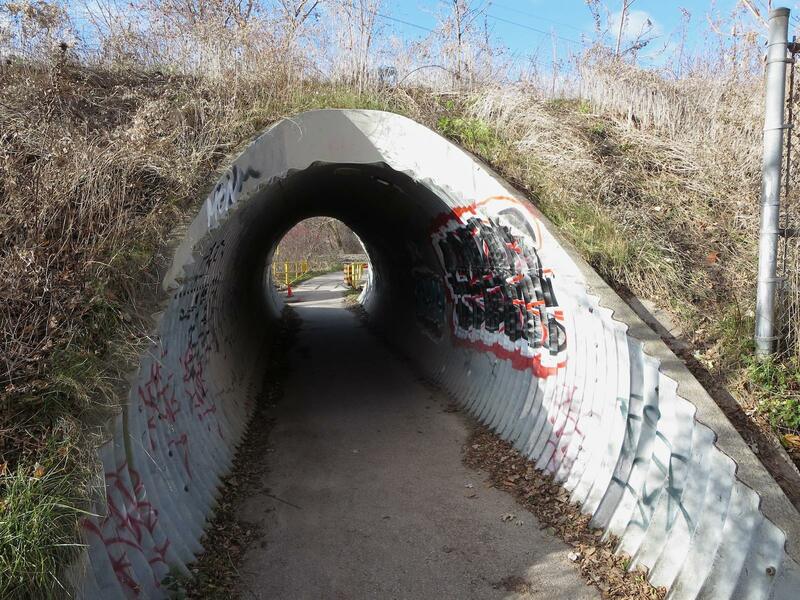 You will not find a garbage can along the side of the recreational trail from Pottery Road all the way down to Lakeshore Blvd. This must all be part of a new counter-intuitive strategy (no doubt having proven to be true in NY City!) that if you do not provide garbage facilities, people will hang on to it until they get home. So much for the rant – let’s keep walking. 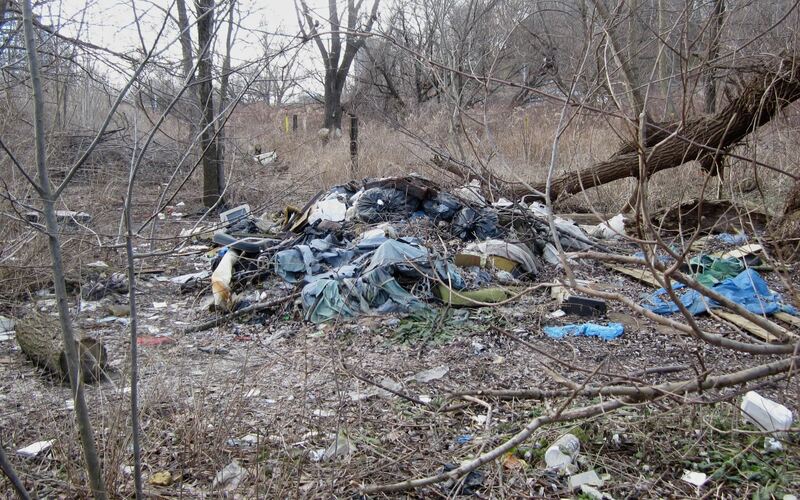 Here is what some people do as they walk the valley – they collect garbage or car tires or other debris of urban life and put it on the side of the trail. The thought is that some City worker will deal with it, appreciative of the fact that some citizen has taken the time to gather it. The particular pile below has been there for two months. Of course, the Parks people do not do the trail in winter. That garbage will be sitting there for another three months! 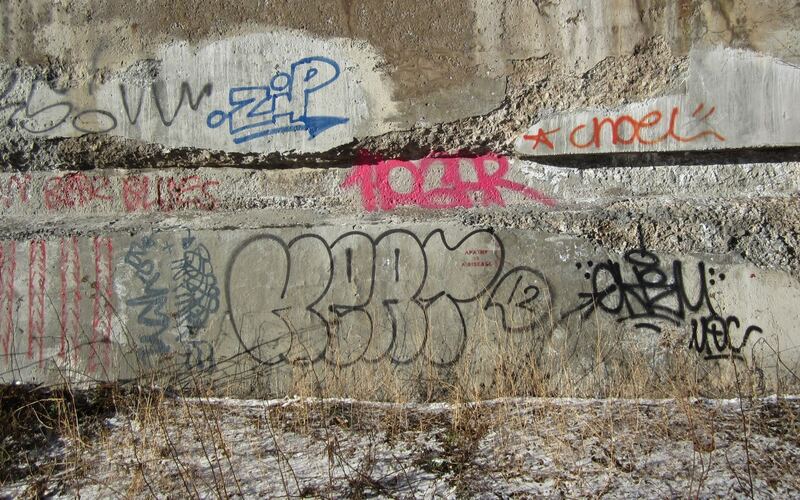 This graffiti and tagging go on for about 100 meters on either side of the Viaduct. Given that it is technically a part of the expressway, I’m sure that yet another city department would be responsible for dealing with this particular strip of post-apocalyptic charm. On the north side of the Bloor Viaduct Viggo and I head on another side trail which takes us right to the banks of the river again. We are now entering another prime camping area – great river view and a bit of distance from all the pedestrian traffic along the recreational trail. It is a bit bare now but in the prime of summer, it is quite shady and hidden from view. Not a bad camping spot at all! 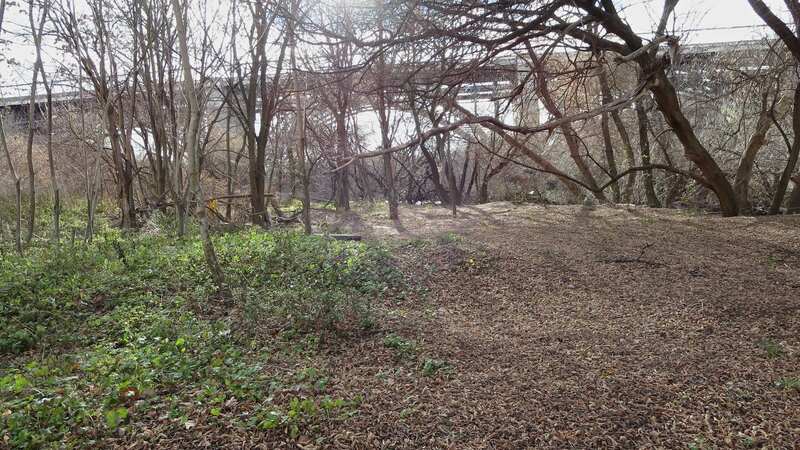 camping area to the north of the Bridge in November – nobody home! I usually take a camera with me on my walks down in the valley with Viggo. As the posts in Viggo’s Den show, he is the focal point of the pix. When the snow covers the garbage or when I edit out as much of the urban environment as I can in my viewfinder, I get to spend a Zen moment in a beautiful place. 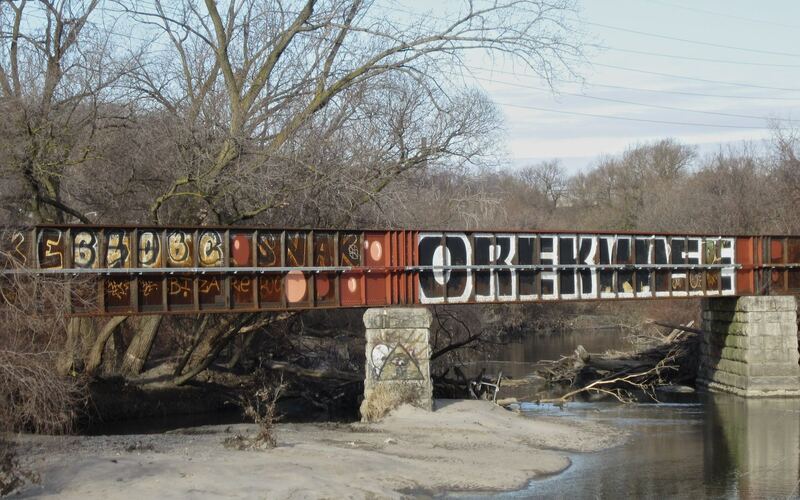 It is this place that everyone should see on a stroll or a bike ride along the banks of the lower Don. 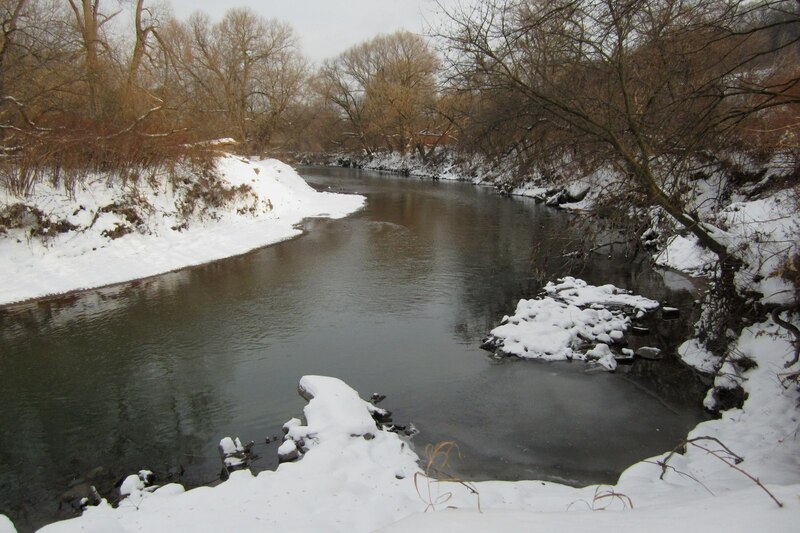 another beautiful view on a morning walk along the Don River just north of the Bloor Street Viaduct – no garbage in view! 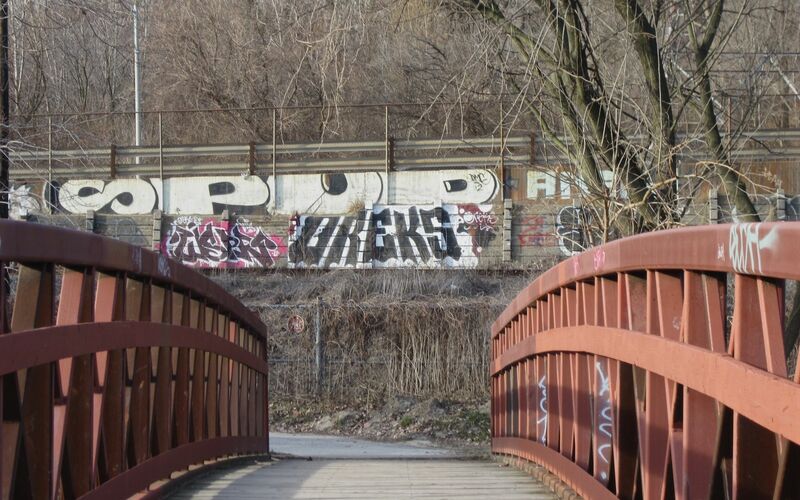 For some reason, there is no section of the Don River recreational trail that is as shabby as the lands on the five hundred feet on either side of the Bloor Street Viaduct. Perhaps the easy access to downtown street life attracts homeless men intent on preserving their independence in a world that cannot be easy for them to live in. South of Gerrard there just isn’t the space or the privacy that this particular stretch provides; north of Pottery Road it just seems like a different and cleaner world. 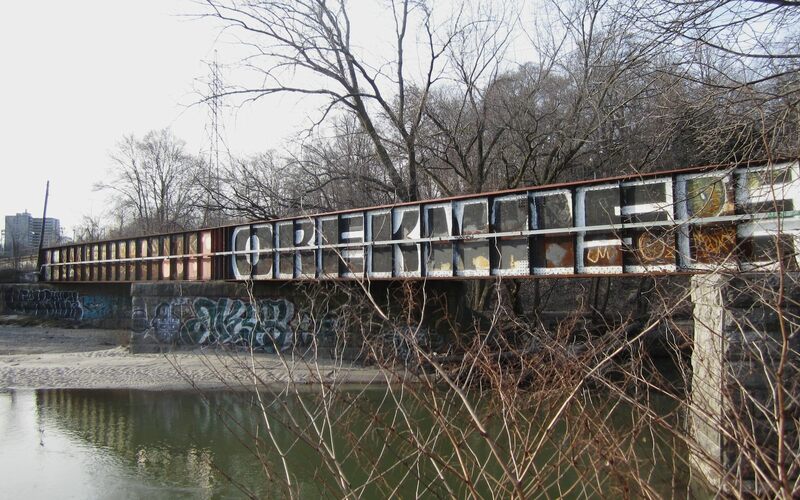 The big question is – Who will assume responsibility for rehabilitating this stretch of our Don River heritage? And if the answer involves more than one department or agency- How do we get the various players to act with some sense of urgency? For the past three years I have looked on – and then looked away – at the mess that my brief photo journey illustrates. I would hate to think that my walks with Viggo down in the valley over the next three years will involve increasing levels of garbage and graffiti as new campers come to claim still-clean spots along the river banks. Surely the City of Toronto Parks department, Metrolinx, and CN Rail can send in work crews for the few days it would take to reclaim the area. There are obviously bigger issues involved here – that of homelessness and that of how to deal with the never-ending graffiti that defaces our buildings and public spaces. 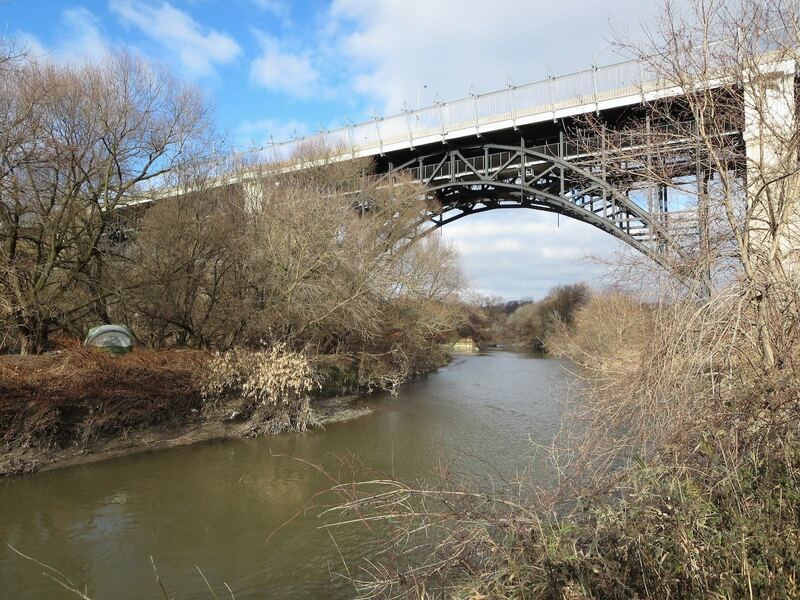 Dealing with these issues should help ease the situation that the lower Don finds itself in. 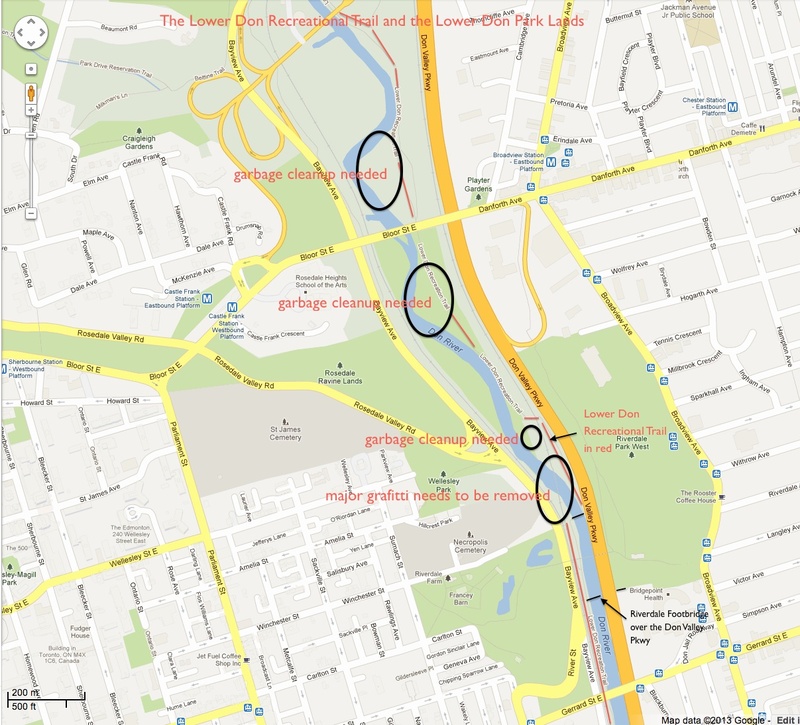 It does not, however, negate the need to give the lower Don Valley some tender loving care now. I’ll keep this post up-to-date with occasional progress reports on the state of the lower Don. 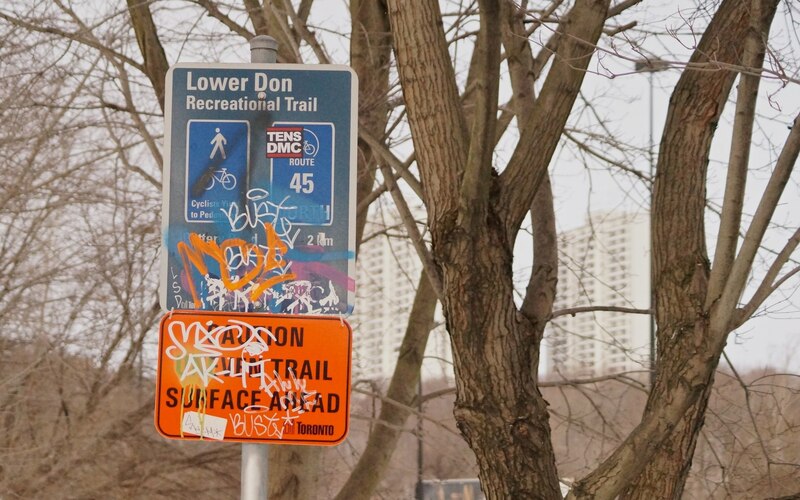 Getting down to the Lower Don Trail is easy. 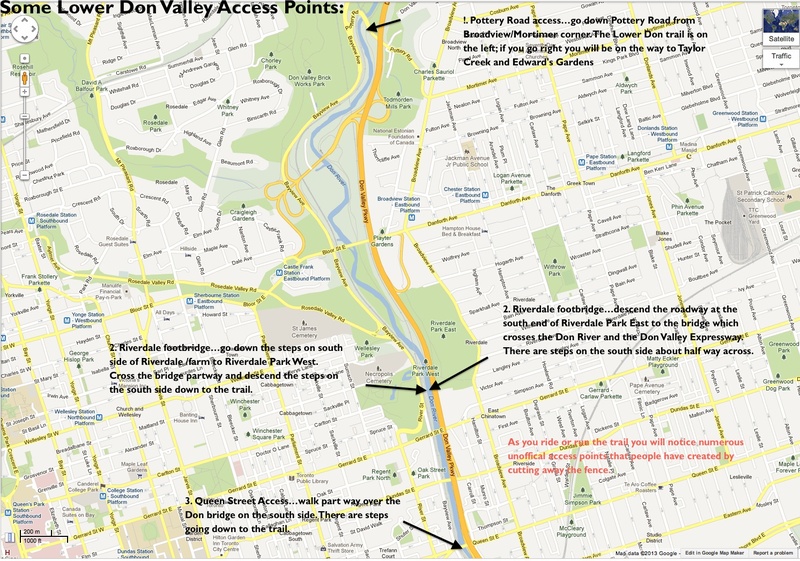 Check out the following map for three possible access points – Pottery Road, the Riverdale Foot Bridge, and the Don River Bridge over Queen Street. Thank you for bringing this to our attention. I will ensure we have a crew in there next week to remove all the garbage, I will arrange for all the signage that has been defaced to be replaced or cleaned. The graffiti on the bridges I will be forward to Transportation for their action. I will also notify CN about the graffiti on their property. 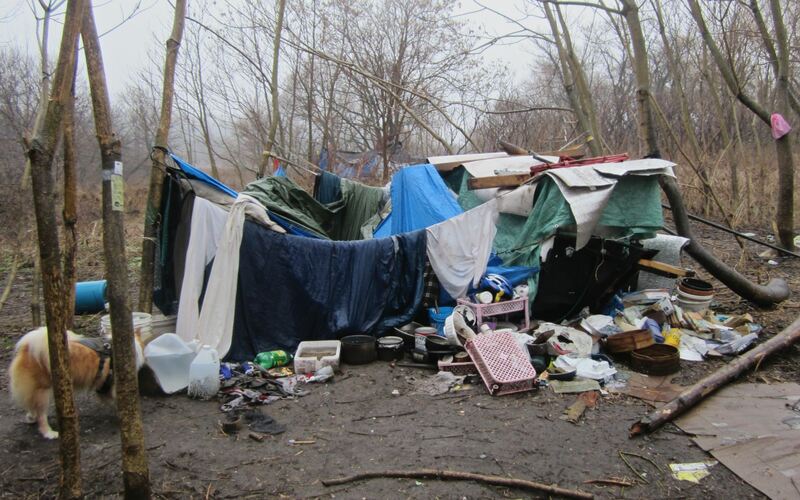 With respect to the encampments, I have spoken to Troy Ford, City of Toronto Parks Ambassador. Troy is already aware of this issue and is in the process of resolving this matter along the Don Bike Trail. I will email you next week to keep you informed of the cleanup. Thanks again for your photos and email. Sounds almost too good to be true! 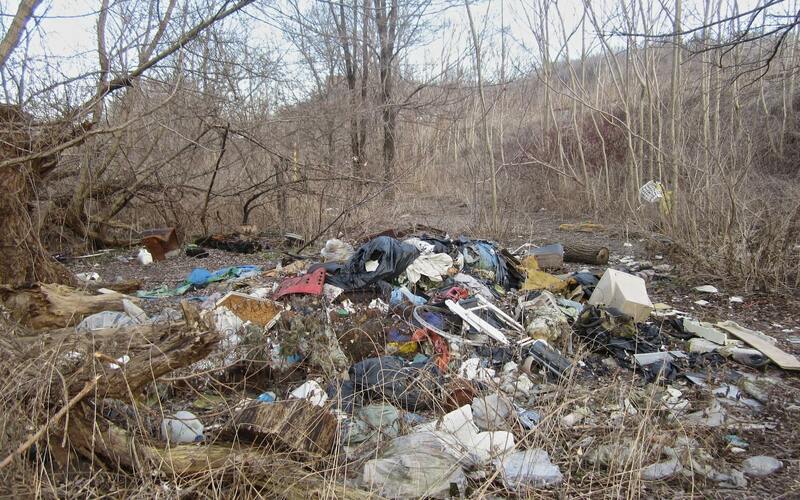 I’ll post before and after photos as things are cleaned up in the lower Don River valley. Also on a positive note, I spent a bit of time at the Parks website and found info on the work it has been doing just north of the Lower Don area; it represents a model for what should also be done with the strip of land between Pottery Road and Gerrard Street. 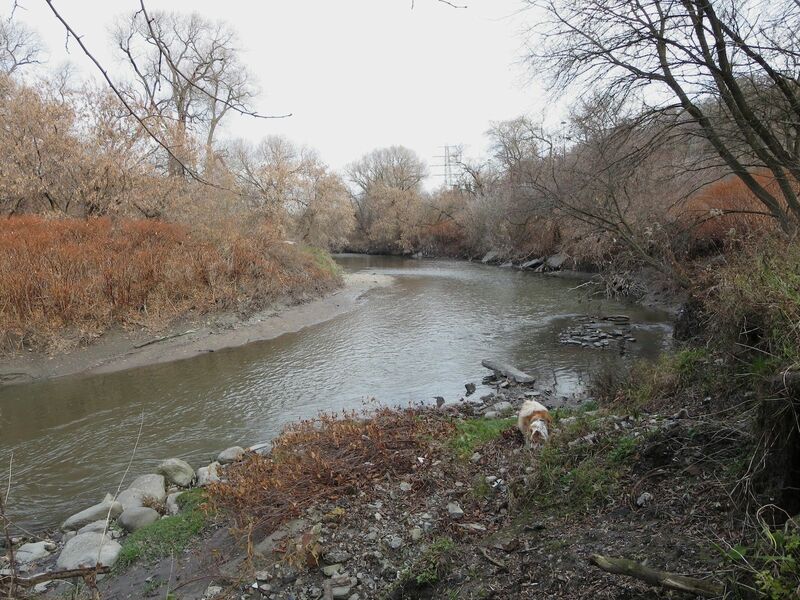 Click on the blue text to find out more about areas the Parks Department has given some attention to- Cottonwood Flats and Crothers Woods. Perhaps one day we will also find a link for the Lower Don. Well, maybe not so amazing. We did our usual ramble this morning and nothing has changed. 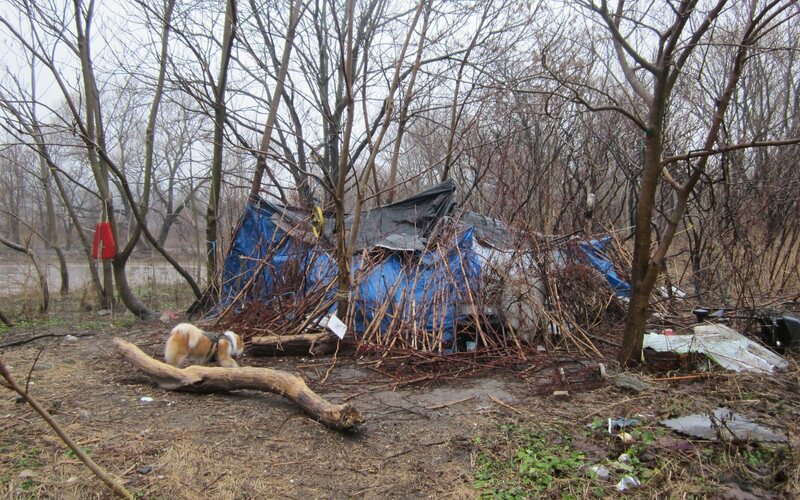 In fact, instead of city workers dismantling the blue tarp shelter, it seems that some homeless guys had been renovating and making it usable again! Unimaginable given the temperature – I regret not having looked inside to see if there was anyone there. The worst of this cold spell seems to be over. Next week the temperatures are forecast to hit +6 C by Wednesday. It’ll definitely be better camping – and clean-up – weather than this week. We’ll see what happens. Having taken a look inside the various tarp-covered shelters in the past couple of days, I’m happy to be able to say that no one is camping down in the valley right now. The combination of drugs or alcohol and -15°C temperatures is a deadly one. 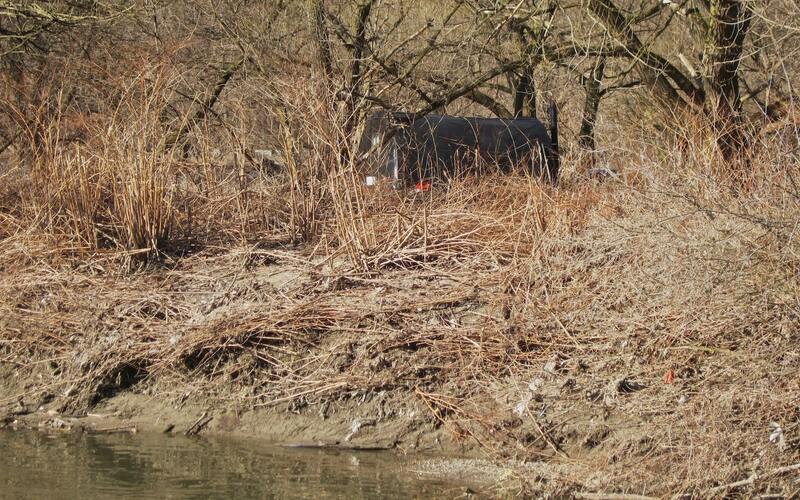 I wanted to update you on the clean up on the Lower Don. I did a tour of the Don with staff and we discussed how we will move forward to getting it cleaned up. 1. We have started the cleanup of some illegal dumping that has happened, material that could be picked up by hand and removed. 2. 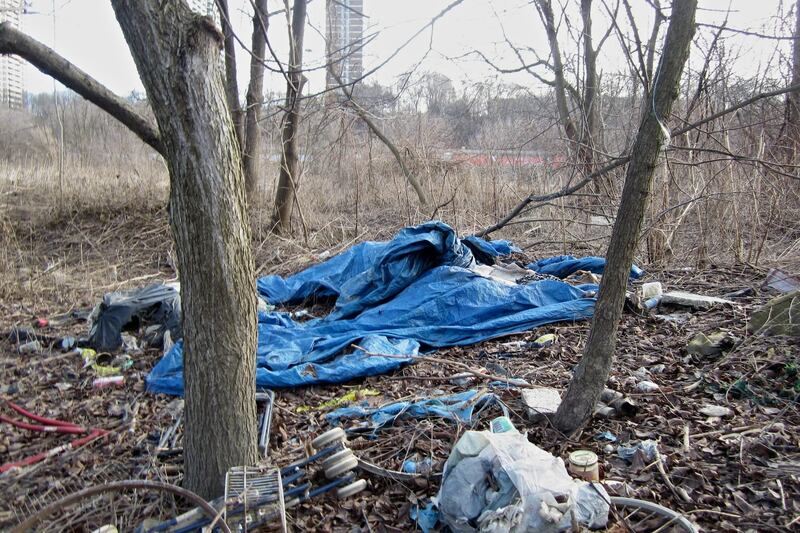 I have a meeting with Troy Ford, Streets to Homes and Ravine Staff on February 5th regarding the removal and clean up of a number of encampments and the cleanup of garbage that these encampments have accumulated in the Lower Don. 3. We are removing all signs that have been tagged along the trail and will be only replacing the signs that we absolutely need to have posted. 4. I will keep you updated on the status on the removal of the graffiti that is on Transportation and CN property. Thanks again for bringing this to our attention and I will keep you updated on clean up. 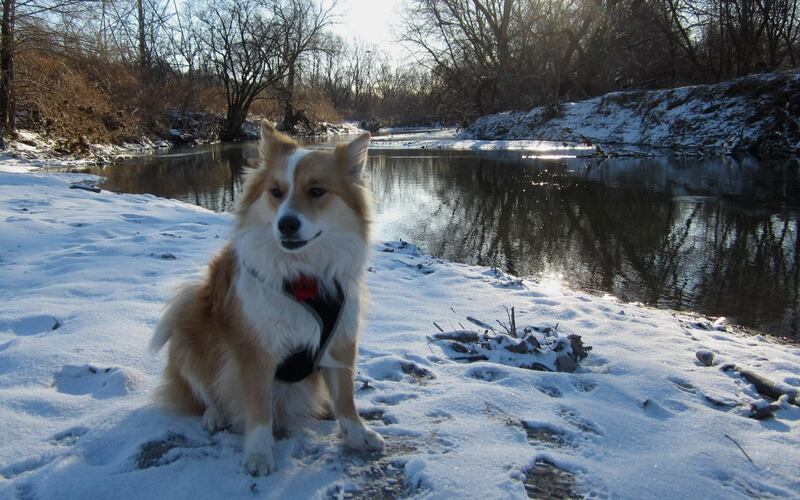 Viggo on ice in the Don Valley – and no graffiti or garbage in the frame! 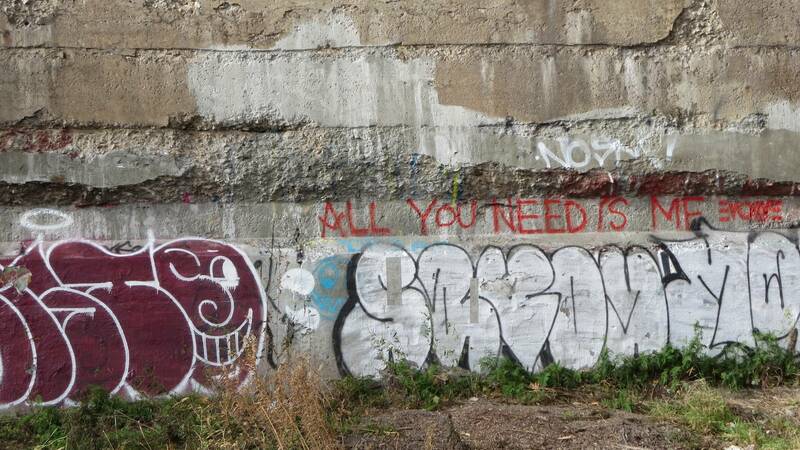 It has been six months since this message was first scrawled on the pavement; it is on the south side of the Bloor Street Viaduct and must be legible from the subway cars up above when they are momentarily stopped on the bridge above the valley. 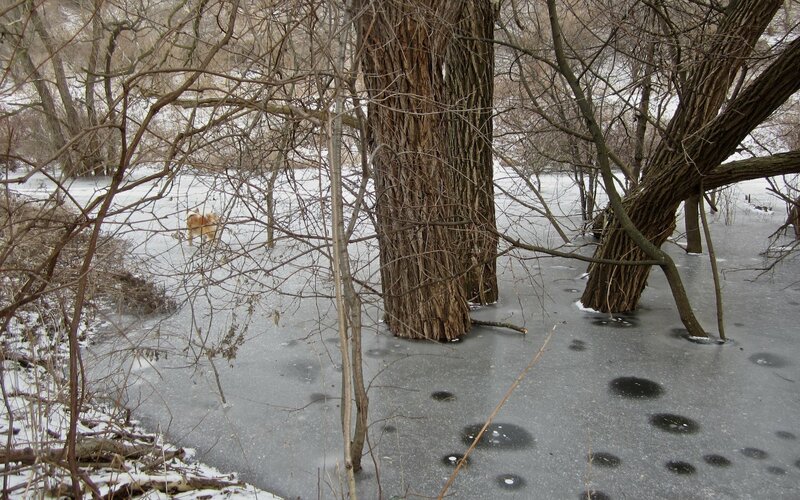 All part of the post-apocalyptic charm of Toronto’s lower Don! The Parks guys seem to have been down here since yesterday morning since they’ve picked up trailside garbage and old tires, as well as taking away the Wetlands info sign. Also there this morning were six guys with white hard hats on looking at the unused bridge over the Don which is covered with graffiti. I Notice their truck sitting on the tracks just before the bridge and expected to see “Metrolinx” written on it. What I saw was PNR Railworks, Inc. It seems like overkill given that no great expertise is required but I hope graffiti removal is a part of their mission statement! I also met again the Somali guy who is actually surviving down there! The last time I saw him, I told him to go to a shelter until the worst of the winter is over. However, his response was the typical one. He said he didn’t feel safe there because of all the crazy people and that there were too many rules. I gave him $10. for breakfast; he really doesn’t look well and had a bad cough. Little has changed down in the valley in the past two months. I missed most of the month of February here in Toronto thanks to my almost-four-week bike trip in New Zealand. I visited South Island, starting in Christchurch and cycling 1400 km around the island. 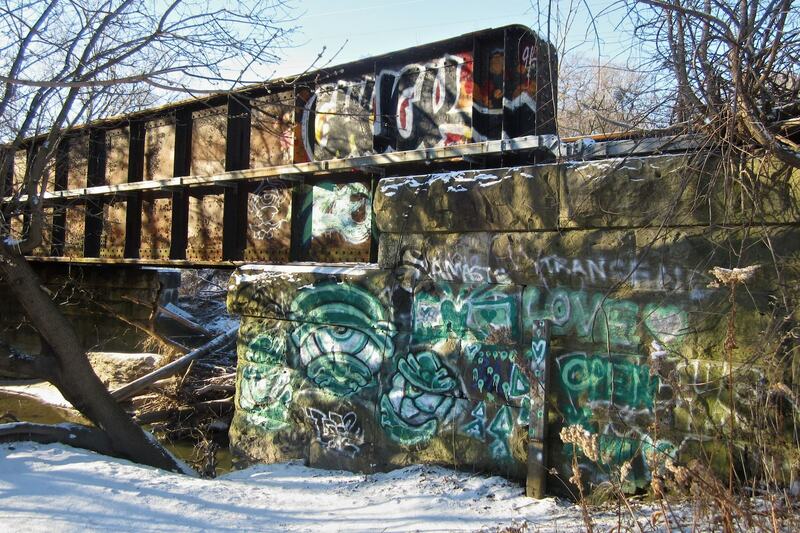 there is more graffiti and urban decay visible in my little strip of the Don Valley than in all of the NZ I saw. Even in post-earthquake Christchurch, I saw few signs of what this Lower Don post shows. What has changed is the arrival of new campers and camp spots. 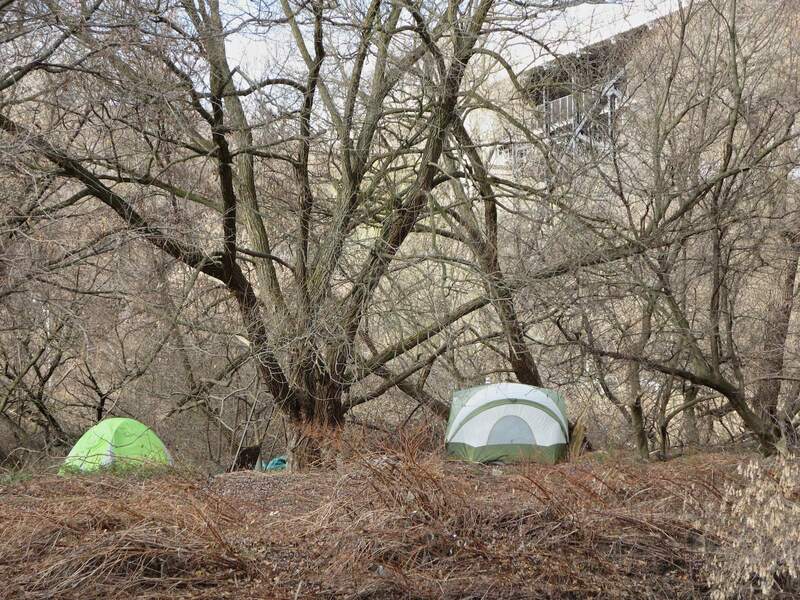 I noticed two new encampments – one just on the north side of the Bloor Street Viaduct on the east side of the river. The other is on the west side of the river just south of the Viaduct. What you see is a black Quonset hut about 10′ long and 6′ high. Trail walker rumour has it that the folks who were formerly living in the bush just before the trail crosses Pottery Road have moved! In a couple of months the structure – one of the more impressive camps I have ever seen down in the valley – will “disappear” in the leaves and grass! I think April is the month that the part-time parks workers are back on the job. One can only hope that the Lower Don is on their list of “to-do’s” for this spring! Nothing new to report other than the fact that someone has picked up the doggie poop bags and garbage at the bottom of the Riverdale Footbridge and stood the “Trail Closed” sign back up. Given that the work was done in October, the sign should just have been taken away but my guess is that this would require another crew from another City Department. We wouldn’t want workers dealing with something clearly out of their area of responsibility. I should have known better! 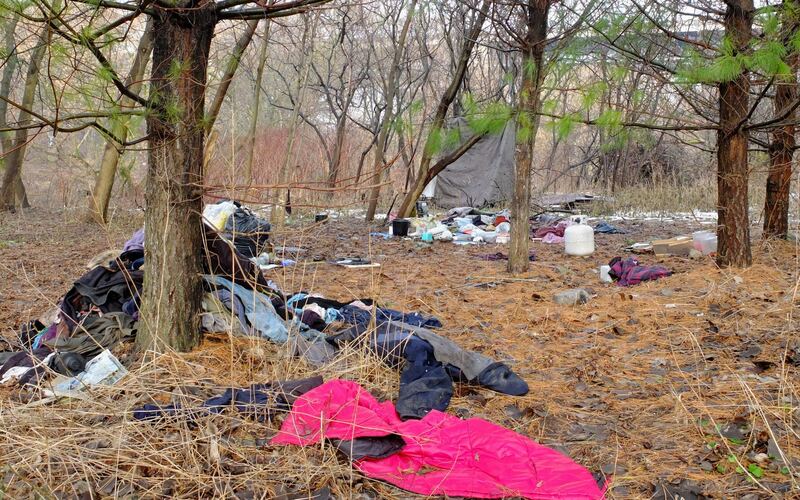 When Viggo and bicycled along the trail yesterday afternoon I looked over into the bush by the river and couldn’t see any sign of the abandoned homeless camps. “Great!” I thought. 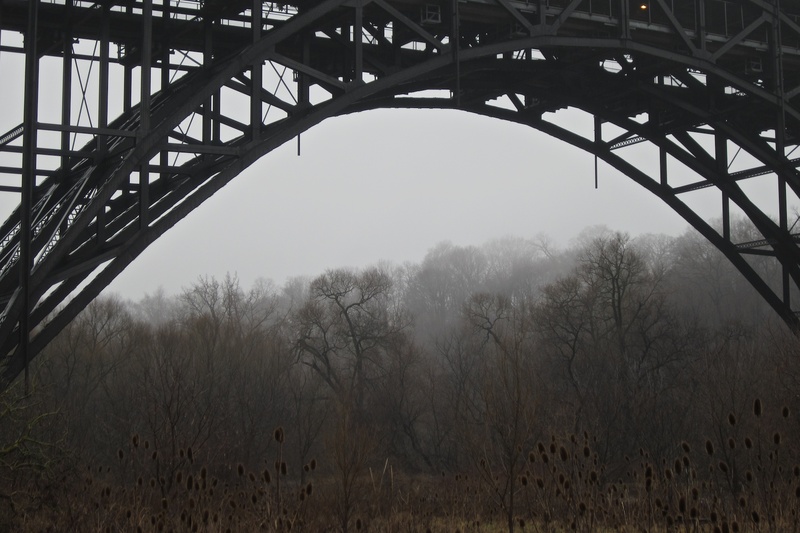 “They finally got around to dealing with it.” Alas, a walk this morning along the four hundred meter stretch of the banks of the Don underneath the Bloor Street Viaduct revealed that nothing has changed. Quite honestly, I cannot even whip up the energy to send the Park Manager yet another email asking him when this department will deal with the problem. Somehow four emails and four promises that the job would be done soon is enough. In two years the Pan-American Games will be held in Toronto. Thousands of athletes will be staying in the temporary “village” being built in the empty space south of Queen along the Don River. I can see our visitors going for a run or a walk up the Don Valley Trail. 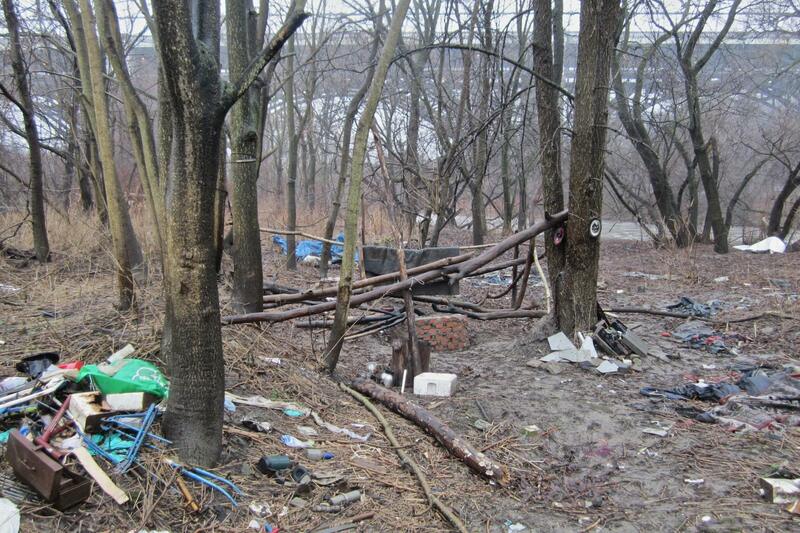 Perhaps a clean-up of the lower Don will happen in the weeks before their arrival? In the meanwhile, I’ll read again this study of the role the Lower Don has played in the history of the city. Its title? 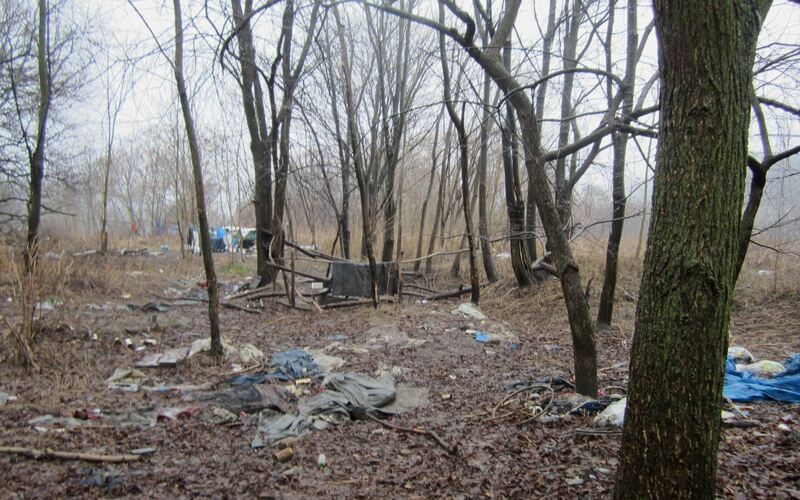 Toronto’s Underworld: the Don River Valley as a “Repository for Undesirables” Click on the blue text to access it – it is quite informative and puts things into historical perspective and is maybe a cure for my impatience. Update: Monday, October 7, 2013. It has been months since Viggo and I have been down in the valley. I walk with him off leash down there. It’s illegal, I know, but I try to pick times when I figure no one will be down there. That would not be the summertime, when the trail is heavily used by cyclists and joggers, especially on the weekends. We were down there on the Friday before Victoria Day weekend and saw a crew of twelve City Parks workers tackle all of the campsites I had highlighted in the map at the beginning of this post. It was an amazing sight! The great don River flood of July also covered large sections of the land between the river and the trail and made camping down there an impossibility for a couple of weeks. In late August I only found one camp on the east side of the river; I am not sure what happened with the Quonset hut on the west side just below the viaduct. One great thing about rainy days like today is that the through-traffic on the trail goes down to almost zero, at least low enough for me to consider taking Viggo back down. Maybe tomorrow will make a good day to see what state the Lower Don is and upload some more current images. Stay tuned! Update: Thursday, November 21, 2013. The area has remained pretty much camper-free since the July flood of the river. 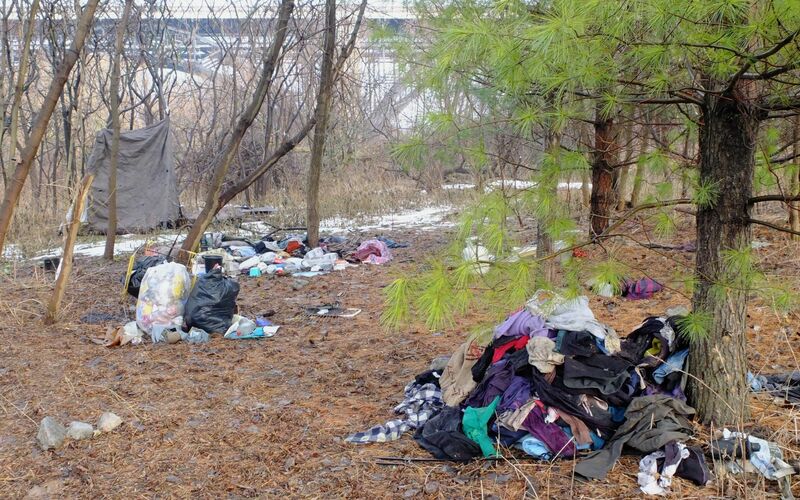 Two small abandoned campsites north of the bridge and two tents on the other side of the river just south of the bridge – sitting where the above Quonset used to be – are all that remain of the big mess that this post focussed on. 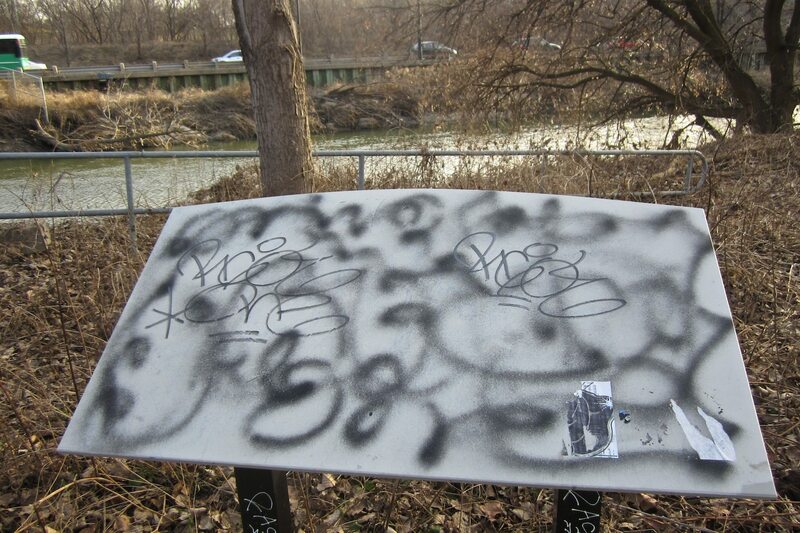 This entry was posted in Ramblin' With Viggo and tagged graffiti on the lower Don valley trail, Metrolinx graffiti cleanup, state of the Don River, Toronto Don River garbage, Toronto homeless camps, Toronto Lower Don, Toronto Parks Don Valley. Bookmark the permalink. Hello. 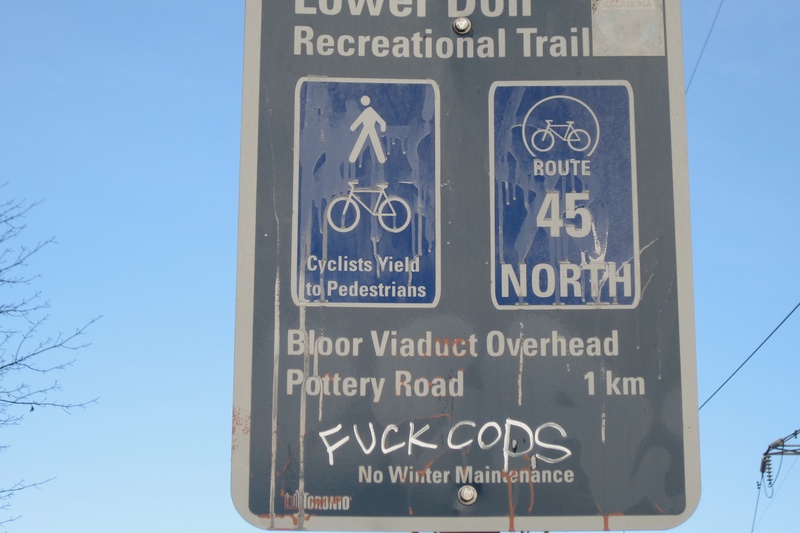 I am a student at Ryerson University doing a project on the Lower Don Trail. I am interested in using a few of these pictures as a way to express safety concerns along the trail. I was hoping I could get your permission to use one or two of your photos. They will appear in a Power Point presentation that will be made to my class. I would like to reference you as the source of the photos (I would just include your last name, and the date the picture was taken). Let me know if this is okay, and if there is a better way to contact you. Thanks! 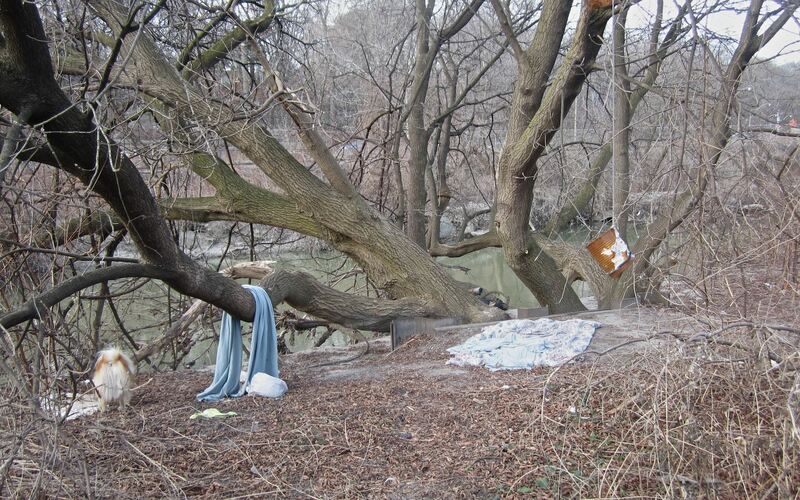 Anon – the lower Don Valley has been a haven for the homeless since the 1800’s! It hosted a major migrants’ camp in the depths of the economic collapse of the 1930’s. From your comments I am assuming you have never walked down there; if you have, you’d get my point about the “mess”. Credit to the city crew which cleaned up the worst of the accumulation of garbage and abandoned tents and shopping carts, etc. The space could be a major park right on the edge of downtown if we wanted it to be. BTW thanks for the tip regarding my dog. These days we really only go down there in the winter after snowfalls. I really hope all that ‘mess’ and all those people you wanted to see gone in order to make your dog walks more ‘pretty’ found safer lodging in a place where they could receive proper help and services. I think graffiti is gritty and beautiful. Keep your dog on a leash.